Used FLK (Fish Lip Kiss) pattern for sizing and heel. I used Turkish Cast On and Magic Loop from the toe up approach. This pair was done on two circulars, and I did an inch on one sock then an inch on the other sock in order to avoid the dreaded SSS (single sock syndrome). Still not quite ready for two at a time Magic Loop! It took me about 15 hours of knitting for the pair which was dramatically better than for the 1st pair (>40 hours). I can only hope this trend will continue! The yarn used for the sock body was Rambler’s Way Handpaint Rambouillet DK (100% American raised wool and spinning) which is spun with a high twist. The heels were done in a worsted 2ply 100% mohair yarn which was very slippery and hard to knit with to keep about the same gauge as the sock body. I also tried “Feeding Ducks and Holding Hands” stitch pattern for the top of the sock body (available as a scarf pattern free on Ravelry). I converted it to a knit only version (it’s written as a purl version). The knit version is initially slightly more difficult to do than as a purl version, but easy enough as long as the stitches are not made too tightly. Loved this stitch pattern as it’s easy to do as well as remember (no need to keep checking the pattern!) and looks fantastic with this kind of yarn (relatively short color repeats). Due to the size of the yarn they don’t fit in regular shoes but are fine in boots or slippers. Now to test wear ability vs version 1! 100% mohair is slippery and more difficult to knit with than all wool. Up to this point had only knit with my 75% mohair – 25% wool roving/ tops that had been handspun. 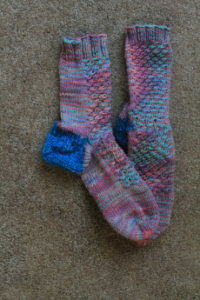 Next….Same pattern, but using superwash wool with 25% nylon ie-classic sock yarn. Already not happy with my choice – took 4 hours to convert the skein into a center pull ball. It’s also a very slippery yarn. The superwash process removes the scales from the wool (so it won’t felt) which not surprisingly makes the yarn slippery vs regular wool.